Under the Sky: Playmobil for the Birthday Boy! Playmobil for the Birthday Boy! Six years ago this time today I was rejoicing in the birth of my one and only son, John Henry. It was a difficult birth as Di can attest to because she was there to see it - and a few days later had her own sweet boy. Such a dear special friend! He is my beautiful brown-eyed young prince and I just love him to pieces. You can see his sweet boy face HERE if you have not already in the previous blog entry where I featured his darling grin. :-) Can you tell I really like him? Anyway, my JH turns 6 today and it is hard to believe he is already that old. Time flies so those of you with new babies - enjoy them! Happy Birthday to our Best Boy. He is truly a gift from God and the best boy we could ever ask for. What a lucky boy! 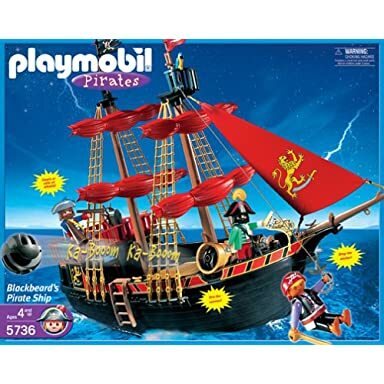 To have a family that adores him....and for getting that very very cool pirate ship!!! Happy Birthday to John Henry! We have a pirate ship that sails our seas here, too. It has only been afloat since Christmas, but it's logged many, many hours. Mixing Nuts and Rocking Out! More Questions! I hope you answer them too! Happy Happy Birthday my 8 year old girl! At least we know they have a sense of humor! Java! Java! Java! Cap ooo cheeeno! Master of the Blog Universe!